This was the 30th headstone installed and dedicated by Jeremy Krock's Grave Marker Project. 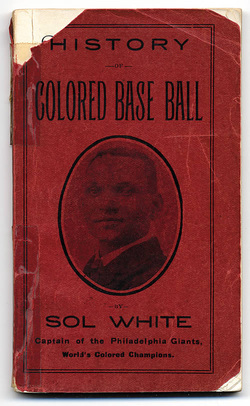 The 1907 book Sol White's Official Guide: History of Colored Base Ball was the first definitive history about black baseball in the U.S. White, an African-American graduate of Wilberforce University, examined nineteenth-century baseball history. In 1995, Jerry Malloy wrote that White's book, ". . . should increase historical awareness and provoke further research. This slender volume is still invaluable as a primary and a secondary source, a chronicle and a memoir, an elegy, and an alarum [call to arms], but its rarity has always been a problem for both the casual reader and the diligent scholar." This slender book can also be described as an almanac, an instructional guide, with contemporary accounts of who's who in black baseball like Fleet Walker, Grant Johnson, Rube Foster, George Stovey, Frank Grant, Kid Carter, Pete Hill, Charles Grant, Chappy Johnson, Bud Fowler, Pop Lloyd, Clarence and George Williams, et al. In 2006, the former sports editor for the New York Amsterdam News, Solomon White was elected to the National Baseball Hall of Fame in Cooperstown, NY. 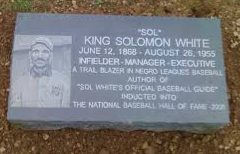 Click below to read articles about Sol White's Gravestone Dedication at Frederick Douglass Memorial Park Cemetery on May 10, 2014. The local planning committee included SABR members Ralph Carhart, James Drury, Jeremy Krock, Peter Mancuso, Philip Ross, John Thorn, and Patricia Willis (CEO of Friends of Frederick Douglass Memorial Park). Special "Thanks" to the Heat Drum Corp from St. Philips Baptist Church, singers Brandon Stradford and Lloyd Miller, and saxophonist Justin Tinker. "Now that Sol has been rescued from unmerited obscurity, the public-spirited might turn to the cemetery in which he resides. Frederick Douglass Memorial Park fell on hard times several years ago, overwhelmed by debt, financial scandal, and declining burials. It has been a struggle for its slim staff – one office worker and two groundskeepers – to maintain the grounds and the records. Solvency seems a distant prospect."